Hardly three months after the Yahapalana Government suffered a shock; humiliating defeat at the 10 February Local Government Polls, a prime reason being the cost of living (CoL), as if committing ‘further’ political hara- kiri, it first increased the prices of domestic gas, and yesterday, milk powder prices as well. Rs 1,676 for a 12.5 kg cylinder. These hikes were primarily made to keep the milk powder market, almost wholly controlled by the private sector and the cooking gas market, 30 per cent of which is also controlled by the same, functional. However, these price increases would give a further thrust to the CoL and inflation, thereby impacting the masses. The reason behind such increases is ‘high’ world market prices and a depreciative rupee. A falling rupee causes inflationary pressure as Sri Lanka is an import dependent economy. The rupee depreciation calibrated by the average selling price of the US dollar for telegraphic transfer (TT) among commercial banks since the beginning of the year to 10 February fell by Rs 1.03 (0.67 per cent) to Rs 155.15 to the dollar. However, its pace of fall has since increased by almost three fold to Rs 2.80 (1.79 per cent) to decline to Rs 158.99 to the dollar due to the political uncertainty caused after the 10 February Polls results. Rs 5,590.19 million. These NFOs have a negative bearing on the rupee due to dollar demand by the market. Similarly, the stock market which enjoyed a net foreign inflow of Rs 4,965.42 million in the beginning of the year to 10 February, thereby giving a boost to the rupee, however, has since suffered a reversal, to record a massive net foreign outflow of Rs 5,123.78 million since, thereby causing further depreciative pressure on the rupee. 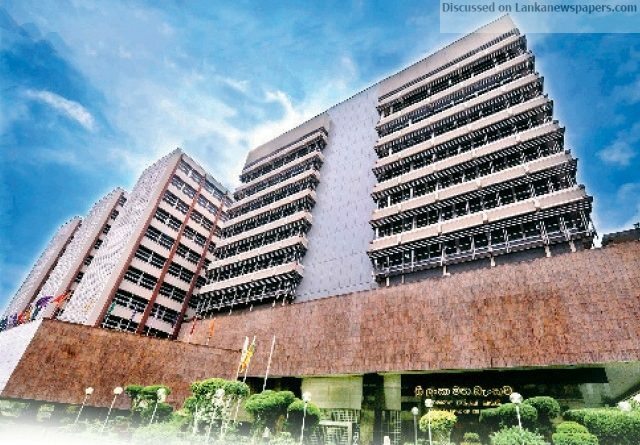 Sri Lanka (CBSL) , beginning on Wednesday (2 May) and continuing up to the following day Thursday, offered dollars at discounted prices from its foreign reserves at the benchmark ‘spot’ rate of Rs 157.80 to the dollar, before further inflating the ‘spot’ by 10 cents, by offering the greenback at a bigger discount of Rs 157.70 to the dollar in the interbank foreign exchange market on Friday, thereby preventing depreciative pressure on the rupee if market forces were allowed to continue having their own way. Rs 158.98, compared to its previous week’s closing rate of Rs 159.01. With the ‘spot’ artificially appreciated by a further 10 cents on Friday, that would result in the ‘dollar for TT’ to gain further when the market opens for trading on Tuesday. Monday is a ‘May Day’ holiday for the market. CBSL, since Wednesday, has reined in further inflationary pressure caused due to a rapidly depreciating rupee by offering dollars to the market at discounted prices. With a low unemployment rate of 4.2 per cent recorded last year, what the masses now need may not be jobs, but better paying jobs to tackle the CoL as reflected by the results of the 10 February Polls. If political stability is cemented, investments will follow and with it better jobs. To ensure political stability, reduce the CoL further, by inflating the rupee value more.